Vesper Fest: Yes, We’re Turning 5! To celebrate five years, Convent’s cocktail hub Vesper welcomes three maestros from around the region: Mar 19 Lorenzo Antinori, Four Seasons Hotel Hong Kong; Mar 20 Aki Eguchi of Gibson, Singapore (no. 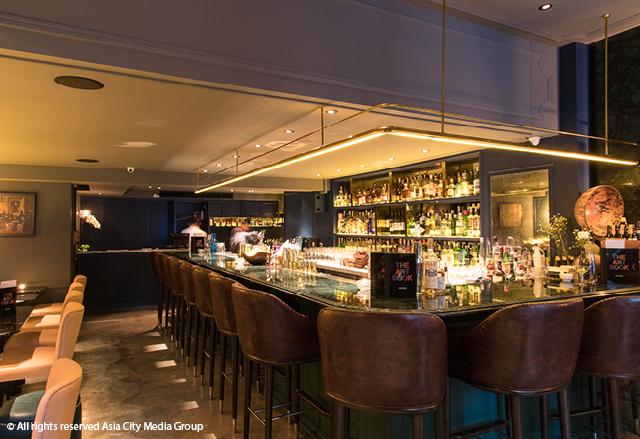 22 Asia's 50 Best Bars) and Mar 21 Rusty Cerven of Skai Bar, Singapore. On Mar 21, Sala Daeng’s Aesop's brings a full-on Greek feast to Suan Phlu’s laidback jazz bar, Smalls. Expect lip-smacking hits like eight-hour lamb shoulder (B600), various dips like taramasalata, tzatiki, hummus and eggplant with homemade bread (B400) and, of course, the classic baklava layered with nuts and honey (B300). The time has finally come. From Mar 21-Apr 7, BK's Magazine's Top Tables Champions brings together 20 restaurants that are literally Bangkok’s Top Tables for incredible deals and unmissable special experiences. Dinners will start from just B1,500++ per person at restaurants where other times of the year you could be waiting months to book—think names like L’Atelier de Joel Robuchon, Sorn, 80/20, Indus, Jua and many more. General booking is now open via the website. Click through to bktoptables.com/champions for the full run-down of deals and events. This Mar 21, Sensi chef Stefano Merlo takes the show on the road to Kanvela House, situated deep in Bangkok's Old Town. For B2,500++ per person, you get to enjoy a five-course sit-down dinner by chef Merlo replete with wine pairing and live jazz. The location, Kanvela House, is a gorgeous building dating back almost a century that's previously served as a boxing oil factory and a jewelers' shop before being transformed into a hotel and bar a couple years back. You'll get to try delicious Sensi mainstays like the Sensi Caprese and the decadent Lemon km 687 dessert (which won Best Dessert in the Diners' Choice Awards for our recent BK Restaurant Week), and much more—all accompanied by a sax, drums and doublebass trio performing sultry jazz standards. Part of Top Tables Champions (see above). This Mar 22-23, The Commons welcomes back again Tsuyoshi Komatsu, the chef/owner of Roppongi Sushi Komatsu in Tokyo, who will showcase his skills and craftsmanship across a 13-course omakase dinner. B3,800/person or B4,800 with sake pairing. Reservations on here for Friday's dinner and here for Sat's. 3/F, The Commons, Thonglor Soi 17, 096-556-1596. This Mar 22-23, The Meatchop devotes two nights where guests are given aprons and gloves and invited to make a mess over a range of premium meats. For B1,500++, you can load up your tray with three choices from grilled pork and garlic sausage, BBQ piri piri chicken wings, BBQ short ribs, pulled pork burger and roast beef, as whipped up by chef Enzo De La Cruz and sous chef Christopher Santopinto. There's also bound to be booze in full flow, a live DJ pumping out esoteric party tunes and plenty of souvenirs to giveaway. Part of Top Tables Champions (see above). On Mar 23, Thonglor co-working space The Hive is throwing a farmers' market featuring organic produce, workshops and craft beer tastings. Check here for updates. Mar 23, 46/9 Sukhumvit Soi 49, 02-662-6062. Head to Pullman Kingpower’s vibrant French-Japanese fusion restaurant Tenshino on Mar 27-Mar 30, when Paris-based guest chef Ryohei Kawasaki (of one Michelin-starred Ken Kawasaki) will be laying on an exclusive five-course set dinner (B5,000). For reservations contact h6323-fb5@accor.com. On Mar 28, chef Napol Jantraget and pastry chef Saki Hoshino of 80/20 challenge leading Thai sommeliers to pair the perfect glass of wine with each dish of their nine-course dinner menu. During dinner, diners will be asked to blind taste and rate a score on how well they think the wine paired with a particular dish. By the end of the night, they'll reveal the names of each glass and which sommelier scored highest. On the menu, there'll be braised lamb legs in massaman curry and charcoal-grilled river prawn with lemongrass glaze, to name just a couple dishes, while dessert will feature guava and sato mousse with rosella oil and powder. B4,500 per person. Booking can be done through their facebook message or email info@8020bkk.com. Mar 28, 1052-1054 Charoen Krung Rd., 099-118-2200. On Mar 29, chef Worawat Wat Thonglor (from Chakrabongse Villas) and chef Rossarin Rin Sriprathum (from Celadon) to host a dinner focusing on authentic Thai tastes at the beautiful, colonial setting of Chakrabongse Villas. To reserve your seat, call 080-045-7778 or 089-810-0498. Mar 29, Chakrabongse Villas, 396 Maharaj Rd., 089-810-0498. On Mar 30, Daniel Thaiger's well-loved burger truck will be serving its juicy patties over at Nowhere BKK. To go with the burger, there’ll also be a feature of Vietnam’s craft beer brands, Gauden and Fuzzy Logic from Mad Genius Brewing Company and a buttload of hand-cut fries from Nowhere BKK. Booking, call 099-394-4417. Head to Sushi Zo on Mar 30, when they’ll be holding a special sake-pairing omakase dinner. With a focus on Niigata prefecture’s Kubota brand, there will be three types sake on offer to pair with 18 courses. Diners will have the chance to sample junmai daiginjo, a smooth and mellow A-grade sake. Also on the bill are full-flavored junmai, which is made with only rice, water and koji mold—no added alcohol—and medium bodied junmai ginjo. Dinner will be priced at B7,000, plus an additional B3,900 for sake-pairing. Hokkaido-born head chef Toshi Onishi's sushi is known to stray from the staunch rules of traditional Edo-style sushi. In general, this means your shima aji (striped horse mackerel) nigiri might come marinated in olive oil and topped with Sichuan pepper, or your red snapper cured under a smoke dome. Kitchen Takeover Episode 2 is back at Broken Eggs on Sunday, Mar 31 featuring chef Sitanan "Kai" Wonghirandecha, Hat Yai-born chef with experience working in New York's culinary scene and now working with celeb chef Chudaree "Tam" Debhakam for pop-up events. The five-course meal will cost you at B1,500 a person. To reserve a spot, direct message them on www.facebook.com/kitchentakeoverbangkok. Limited to only 40 diners. This Apr 5, don’t miss chef Black (Phanuphon Bulsuwan, a master of fermentation techniques and champion of sustainable causes) when he cooks at Siwilai City Club at Bangkok’s Central Embassy, in the latest edition of the club’s quarterly “Kitchen Takeover” series. A B1,500+ per person, he will be preparing a four-course dinner under the concept “Northern and Zero Waste.” Seasonal northern ingredients will star in every cause, but beyond that chef Black’s food doesn’t stick to rules. Siwilai City Club takes over the open-air deck on level 5 of Central Embassy shopping mall, flanked either side by a suite of restaurants and bars. Their last “Kitchen Takeover” was a must-book event in partnership with Hong Kong’s Yardbird yakitori specialist. We expect reservations will be essential this time around, too. Call 02-160-5631 or Line message @siwilaicityclub. Hooters Silom’s latest promo guarantees that if your lunch order takes more than 15 minutes to arrive, you will receive a free meal value between B199-299.